There are many materials that can be used to build a board with. The three main board building materials are Baltic Birch plywood, Bamboo and Canadian Maple veneer. Other materials include solid wood for Vlam, (vertical laminated) aluminium and foam filled carbon fiber Composite boards. 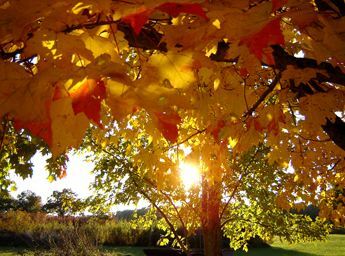 The most common material used today is Canadian Maple. Finding quality materials to build boards with can be challenging. 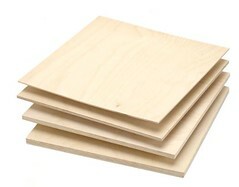 Local big box lumberyards do not carry proper board building materials like 100% Baltic Birch or 1/16″ maple veneer due to the limited uses for the material. Demand for these materials as a home building product is low so specialty shops are usually the only places where they can be accessed. 1/8″ thick Baltic Birch is made from three layers of veneer. Usually the face veneers are 1/32″ thick and the core is 1/16″. Thicknesses may vary from different manufacturers. 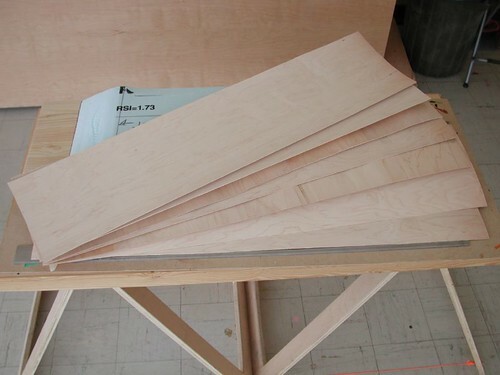 1/4″ Baltic Birch is not recommended for laminating boards. 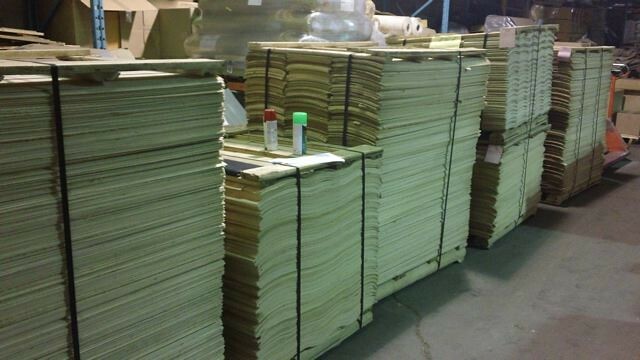 Bamboo sheet stock is made up of many thin lengths of bamboo glued together, edge to edge to make 4′ x 8′ panels. These panels are then milled flat and laminated on top of one another to produce different thickness configurations. You can see the individual pieces of bamboo and the laminating in the picture below. 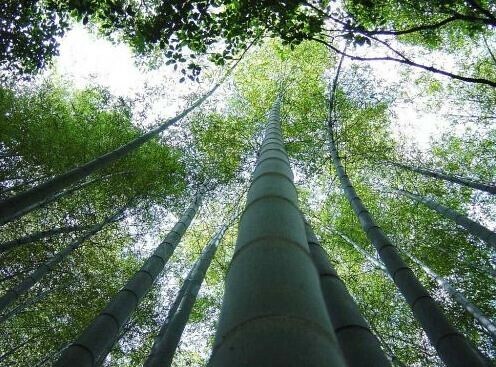 Bamboo is marketed as a green product but there are many who say it is not. Here are a couple of sites that are worthwhile reads on this subject. It does not work well with carbon fiber as the endgrain of the bamboo are very porous. Edge sanding of carbon layer will embed particles into the open grain structure of the bamboo bamboo and is not pleasing to look at. Fiberglass works fine as it is transparent. 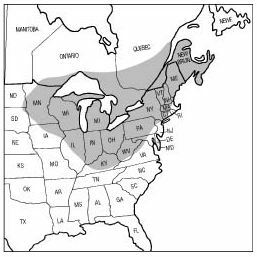 The best maple for skateboards is grown in northern Canada and is called Sugar Maple (Acer Saccharum) Studies have shown that the colder the climate, the tighter the growth ring will be because of the short growing season. The farther north the tree is harvested, the harder the Sugar Maple will be. The cross grain veneers are often sent to us from the mill stitched together. This is where smaller pieces are cut and glued together to make one 48″ piece. 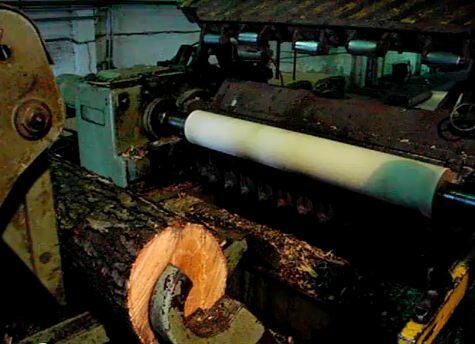 Veneer mills do this to be efficient and environmentally responsible by making use of all the wood cut from the log. Usually the glue joints are stronger than the surrounding wood. If one of the glue joints break it can be easily fixed by slicing with a sharp utility knife a across the veneer, creating a new edge on both pieces. Re-glue them back together using masking tape to hold the joint until the glue dries. Here is a video (post soon) showing how this is done. 1/16″ maple veneers are easily cut with a sharp utility knife. 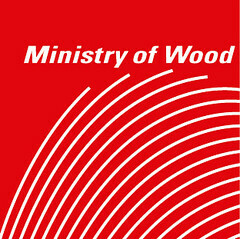 Draw a straight line on the wood with a long ruler and score the wood with the utility knife three times. Bend the veneer against an edge of a table and it should easily break along the line you have scored with the knife. 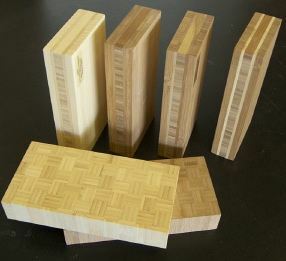 Read all about our Birch veneer (exclusive to Roarockit) in this three part post on ROCKIT TALK. Birch veneer is a wonderful alternative to Bamboo. It is grown in Canada so has a very little carbon footprint. Colored veneers can be used to enhance the look of a board. Placing a layer of infused veneer into your stack will give the board a colored line at its edge or use as a top or bottom layer that can be painted afterwards. There are few tutorials about infusing dyes online. Here is one site that shows small pieces of wood being infused in a home made chamber. Here is the selection of infused wood we have in stock. It comes in both street deck and longboard sizes. Plastic laminate was invented by the Formica company in 1912. It is composed of many layers of resin-impregnated craft paper and a layer of Melamine resin. The top decorative layer can have a texture pressed into it and also be printed. In Canada Arborite, a similar product, was invented in the 40’s. We stock RockitLam in 12″ x 48″ sheets in many interesting colors and textures. 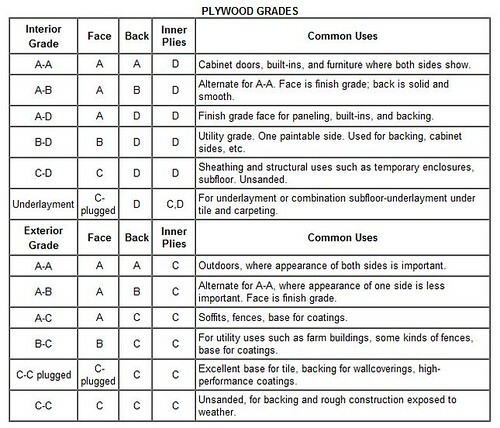 Builders may not be able to find a broad selection of this material locally in these small sizes. It is also thinner than what can be bought at building suppliers. I have two tutorials on working with this material: see gluing RockitLam and also priming and painting. Both tutorials are a must read! Drop norah@roarockit.com an email. She can tell you if it is possible to send the materials. Hello I’m from Belgium and I’m gonna build my own long board and I’m looking for a wood who is strong enough cause I’m 6,5 feet tall and 200 pounds heavy. The ideal one would be classical dark brown wood like them who are used for arbor http://www.skatesonhaight.com/Arbor-longboards-Koa-Blunt-Complete-p/arbcrbk.htm . I do’nt would paint it, I just would put vernish on it and a transparent grip on it but no carbon so it must be really strong. Do you think something like this is possible? Wow where do i start. I’m George 52 yrs old . i grew up in long beach ca. bought my first skateboard Dooley’s Hardware Store no longer there . around the 50th block of Long Beach Blvd . 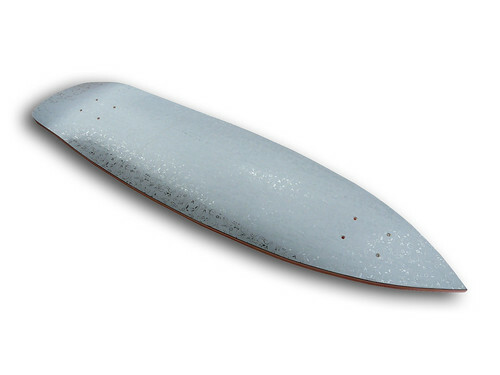 a small wood board w metal wheels . I rolled into a leaf stem and stopped instantly flew head first hands into sidewalk . it sucked. so i bought a black knight wood board w clay wheels I rolled into a pebble same thing flew forward I was learning .how to land when i stopped instantly that board sucked ,,,hang ten banana board riser pads any skateboard wheel i’ve ever had sucked . The last 21 years Have been the most fun of the 43 yrs ive been skating i skate almost every day . 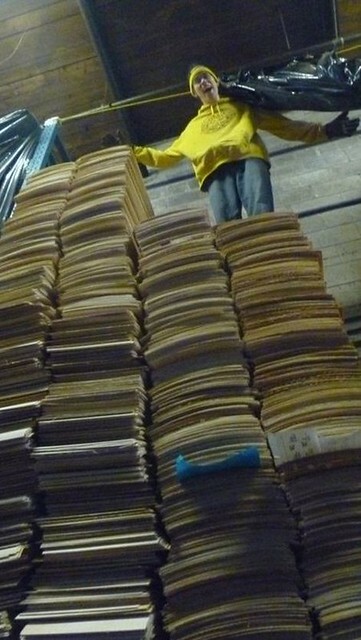 ive skated 8 to 10 bags of grocery’s home. Anything i can fit and still push and coast ive skated home. The last 2 years ive been building my decks from 7 ply plywood .now i find a buffet or dresser that has a 1/8 ply board for backing i glue plys together draw a shape cut it out i soak wood in hot water i bend concave clamp till dry then bend nose and kick tail sand varnish sand paper for grip tape . cut wheel wells out im tring to be as low to the ground as possible . i use the lowest trucks i can find .i slap the wheels of my choice well go to my youtube channel George Kimmell skateboarding on ice .